A three stone engagement ring represents different stages of a relationship. Three stone rings represent past, present and future. 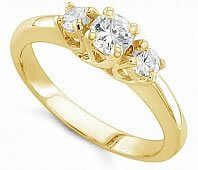 They are also popularly known as anniversary rings. 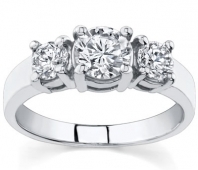 Three stone rings have special characteristics that distinguish them from traditional rings. In three stone rings, all three gems may be fairly equal in size, but the central stone may be slightly larger than the other two. 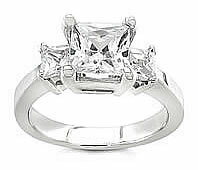 If you notice, three stone rings are a heavier carat weight than traditional solitudes. All stones in this engagement ring are of the same shape, with round and princess stones being most popular shapes as they can fit perfectly. Other stone shapes include marquise, emerald and oval. Most people use three diamonds in the three stone rings. 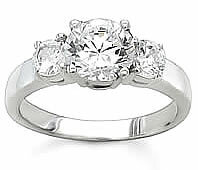 Diamonds are considered most popular, but it is possible to customize a three stone ring with other gems. A three stone engagement ring is a perfect blend of three relationship stages – past, present and future and is a gorgeous alternative to traditional rings. A three stone engagement ring is far more expensive than many traditional settings that use smaller, less costly stones as embellishments. Much of the ring’s price depends on the stone quality and depending on the cut, clarity, carat weight and color of the gems; the price can vary significantly from ring to ring.